Welcome to the second edition of the Old Cazadero 300K brevet! This ride is designed to be beautiful and challenging, a celebration of the Northern California landscape and an exercise in endurance and self-sufficiency. The 302Km (188mi) course features approximately 4600m (15200ft) of climbing, several miles of dirt roads, and even a river crossing (you may need to carry your bike). The route traces minor roads---some of them one lane wide---in Marin and the coastal mountains of Sonoma, then heads back to San Francisco via a scenic and hilly 50-mile stretch on CA-1, the Coast Highway. It showcases some of the prettiest countryside north of San Francisco: rolling pastures and farms, redwood forests, fragrant stands of bay and eucalyptus, and spectacular coastal cliffs. The ride is comparable in difficulty to the Terrible Two double century, but without the support or the emphasis on competition. Whereas Terrible Two has four major climbs linked by long fast sections, Old Caz has only three big climbs but few flat miles. Start and finish location: Strauss Statue, adjacent to the toll plaza on the San Francisco side of the Golden Gate Bridge. Waiver and registration form: see the SF Randonneurs site. You may bring payment and completed paperwork to the start on the day of the event, but we ask that you notify us by Thursday, July 28 if you intend to participate. Please send email to our RBA. For more information, please see the SF Randonneurs site. Around mile 76.1, shortly after turning onto Old Monte Rio Rd from River Rd, you will find a concrete barrier blocking the road. The road is closed to automobile traffic due to a landslide, but on a bicycle you can cross over the barrier and proceed with caution. You will find another barrier a couple hundred yards down the road. The left turn from Old Monte Rio Rd to Cherry St (mile 78.5) is easy to miss. It's on a descent, and Cherry St is narrow and poorly signposted. Keep an eye on the odometer. You'll know you're close when you pass Duncan Rd. The upper part of the Old Cazadero dirt descent (after mile 84) is in better shape than usual. Don't let that lull you into a sense of security! There are plenty of fallen trees and loose rocks further down. At the beginning of the Willow Creek climb (approx. mile 112), a path to the right has been made more prominent. Stay left (straight). The receipt control at Point Reyes Station is not at Black Mountain Cycles this year. Two businesses in town are open until 9pm: Palace Market (11300 Rt 1) and Whale of a Deli (997 Mesa Rd). After 9pm, an SFR volunteer will be stationed by Palace Market. Old Caz 300 is a hard ride. To estimate how long it will take you, add 30% to your finishing time on the traditional SF 300K, which has about half as much climbing and no dirt roads. Friendly competition and individual challenge are central to randonneuring, but on this particular ride you may have more fun if you take a laid back attitude. Ride with a friend, pack a camera in your jersey pocket, and plan to make a (long) day of it. Enjoy the landscape and ride safely. If you do choose to ride for time, remember that time is won or lost on the climbs. TAKE IT EASY ON THE DESCENTS. Many of the roads on this course are narrow and poorly paved. The dirt sections are rutted and strewn with debris. Off-camber turns and sharp switchbacks are common. You are likely to ride for miles without encountering a single vehicle, but it takes only one to ruin a beautiful day. BE CAREFUL OUT THERE. Finally, what bike and tires to use? Any reliable, well-maintained road or cyclocross bike will do: a mountain bike is overkill for the dirt sections. 32mm slick or semi-slick tires are probably the best bet for most riders on this course. The ride begins by crossing the Golden Gate Bridge to San Francisco's northern suburbs. Don't miss the views from the bridge, and watch for herons and other birds in the marshes by Mill Valley. The first climb of the day, Camino Alto, is short and pleasant in the morning air. A few miles further north, White's Hill marks the end of suburbia: for 160 miles you will pass no population center larger than a few hundred people. The course drops into the Lagunitas watershed, then climbs for a mile to Dixon Ridge before descending through redwoods to Nicasio. You now ride for many miles across rolling Marin countryside, much of it dairy pasture. You can pick out distant roads by the tall stands of eucalyptus used as wind-breaks. Short rollers alternate with longer climbs. On a clear day, Wilson Hill rewards you with a view across Sonoma and Napa valleys to the hulking profile of Mount St Helena, 40 miles away. Similar views unfold near the top of Burnside Road. After a steep and bumpy descent to the hamlet of Freestone, the course enters deep redwood forest and climbs gently to Occidental, then descends to Monte Rio and the Russian River. Old Cazadero Road begins a few miles beyond Monte Rio. A 3.7-mile climb, it gains 800ft in its first 1.4 miles alone (an 11% average, with much steeper sections). Enjoy the fragrant bay and madrone forest, and take in the views of the surrounding hills. At the summit you must hop two gates and negotiate a 1.6-mile dirt descent to Austin Creek. In winter the trail is soft mud and it is not difficult to bomb down it at full speed even on a road bike, but by summer the surface is hard and rutted. Watch for fallen trees and loose rocks. Don't be afraid to walk. At the bottom, Austin Creek provides cool solace. 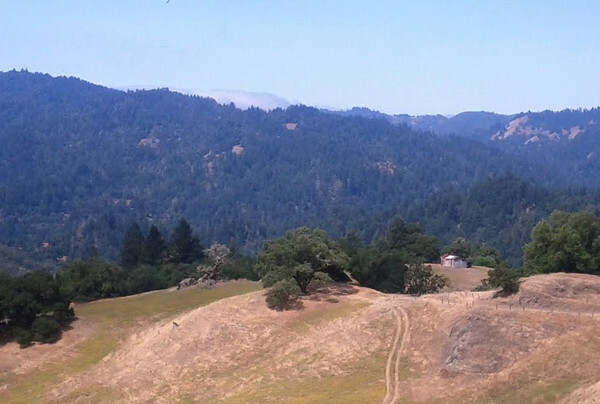 Carry your bike across a field of small boulders and through a gate, then climb on packed gravel for a mile before dropping steeply to Cazadero. 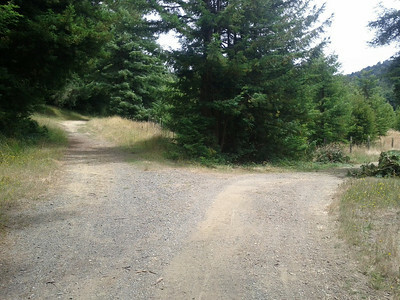 Fort Ross Road is the course's second big challenge. It climbs Black Mountain, drops down to the Gualala River, then climbs again to the coastal ridge. The reward is Meyers Grade, a breathtakingly fast descent (more than one mile at 18% grade) with expansive views of the coastline. Now you are on Highway 1, but not for long. Just south of the Russian River you take a left turn onto Willow Creek Road, one of the true highlights of this ride. The pavement gradually disintegrates, then disappears entirely as you tackle a 4.6-mile traffic-free dirt climb. Be sure to carry some momentum into the switchbacks, or you may need to walk. After rejoining Highway 1 by way of Joy Road and Bodega, we take back roads from Valley Ford to Tomales. Valley Ford Franklin School Road, remote and beautiful, features three increasingly steep climbs. Don't miss the views of Dillon Beach and the northern tip of Point Reyes. The course returns to Highway 1 and follows it for over 45 miles, from Tomales all the way back to the bike path in Sausalito. The stretch to Point Reyes Station is familiar San Francisco brevet territory: the road rises and falls along the scenic shore of Tomales Bay, alternating sheltered coves and windy bluffs. Look for dairy cows on the left and oyster beds on the right. 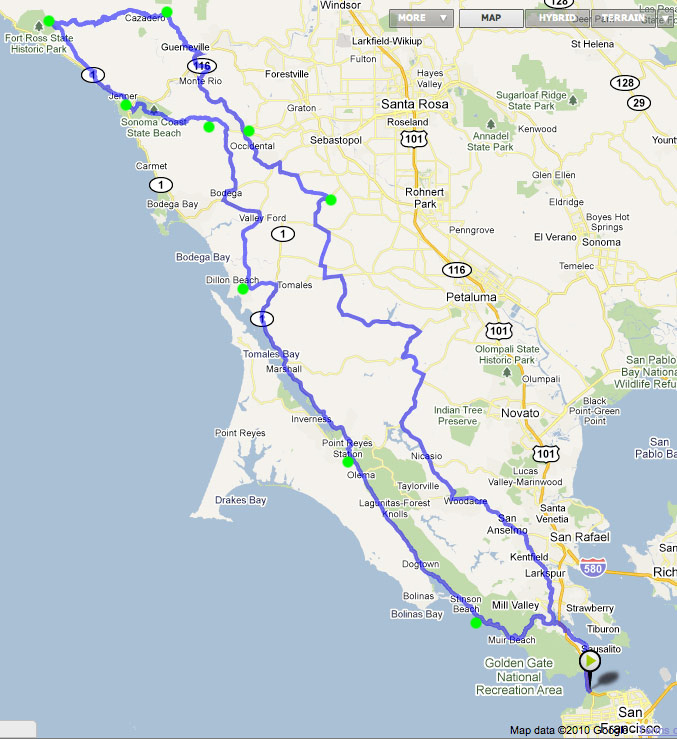 But rather than turning inland from Point Reyes Station to Nicasio, as the traditional San Francisco 300K does, our route continues south across Olema Valley to Bolinas Lagoon. The last real challenge of the day comes 20 miles from the finish. The road pitches upward from Stinson Beach to Steep Ravine and winds above coastal cliffs for 5 miles before plunging to Muir Beach. Sunset from this road is memorable. The climb out of Muir Beach gains only 600ft of altitude, but with 177 miles in your legs it will feel like more. But now you're almost home: just a cruise through Sausalito and a short climb to the Golden Gate Bridge before your triumphant return to San Francisco. This ride was first designed in 2010 by Max Poletto, with much help from David Strong, Kara O'Keefe, Rob Hawks, Mike Varley, and several San Francisco Randonneurs volunteers. Click here for the site for the inaugural edition.